At 6:00 a.m., blinking automatic doors flooded the lobby of the old Officer’s Club at Bolling Air Force Base with a crisp wind and sense of history. 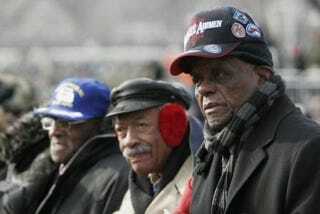 Later that morning, a group of Tuskegee airmen did something once unimaginable, by witnessing the presidential inauguration as special guests of Barack Obama. “This is the crown jewel of the political process,” said Samuel C. Hunter Jr., an “80-something” former bomber pilot. As an impromptu volunteer, I spent part of Inauguration Day with a group of roughly 200 heroes, many once treated as civically unequal in wars abroad and at home. To witness such a moment among these men who, to paraphrase James Baldwin, were candidates for death in America’s defense but were considered less human by their comrades and officers, was a humbling experience. I was struck by the absence of bitterness over the past in these surviving airmen. Mr. Whitfield added he is not trying to claim an exclusive racial connection to President Obama. But for a man who served America to finally have an African-American president could only make him more a part of the country that he has already served. There was some expectable entropy as organizers worked to usher the airmen down to the Capitol. Some family members realized at the last minute that they might not receive credentials to participate with their family airmen. But the mere opportunity to make it work—untangle the snags and get rolling—was priority and privilege for all volunteers. In other words, Barack Obama has clearly been embraced in a way many of these airmen never were during their service. Artis has his own ideas on why he and the other Tuskegee Airmen were invited to the inauguration. Their presence at the ceremony matters “because we have to keep the legacy going,” he said. Like Martin Luther King Jr.’s birthday celebration, the Tuskegee Airmen story is another reminder that as much as Barack Obama’s ascendance feels like a beginning, it is far from the case; President Obama’s inauguration represents a continuation of African Americans’ service to a country that could not always look them in the eye and call them sister or brother. As our motorcade blared down First Street in Northeast Washington, D.C., eventually speeding between the Capitol and the Supreme Court, soldiers stood at attention saluting the busloads of Tuskegee Airmen en route to an event few of them thought they’d see in their lifetimes. Several ordinary citizens, upon seeing the signs on our buses and realizing precious cargo we carried, would stop and salute them, too.